Yes, of course we are thrilled, excited and lets throw in an ounce of frightened for good luck. Due date August 13th (oy the heat). There are so many wonderful things about this. A sibling for Alex (who has been asking for a baby for over a year), a new baby (A NEW BABY! ), and frankly we are thrilled to be adding to our wonderful family. But being 43 there are fears that run through your head. Ok fine.. I dont think there is a single mother out there who didnt have fear in her pregnancy, founded or unfounded, its difficult growing a human being in your uterus. Fears run marathons inside concerned brains. I will not let it take over my thoughts. But we will talk about them rationally here when they arise. There will be a ton to talk about in the coming months people.. and I’m armed with words, so watch out! Gear. Holy moley all the new things that have come out in the last 5 years. Plus-size maternity wear. Oh yes, we will talk. Slings and carriers. Most comfy options for us. Work/life balance. As a mother who works full time outside of the home, there will be some things to discuss here. Not only will we discuss things like flexibility and leave, but how to get through the workday when you really really need a nap. Once I learned I was pregnant, I did what I would normally do and turn to the blogging world. Surely someone was already covering this subject with all the blogs that are out there now. I was quite dissapointed to find very few (VERY few) blogs about plus sized pregnancy and infant care. Pregnancy over 40? Not that either. Sadly, when I did a google search for both of these terms, I landed on blogs where every post seemed like a paid advertisement or a plea for a gift card. I cried out in pain. Where are all the good writers out there? I know you are there. There are many wonderfully written parent blogs out there, many of which I already follow. But none that I found could answer my specific questions. My questions are not that unique… I know there are others of you out there. If you are reading and have people to recommend, by all means post them in the comments! Please! I was encouraged by someone to fill a niche if I could. Plus-size? Over 40? PREGNANT *gasp*. I know I’m not the only one. I am no stranger to pregnancy blogging.. so I will pick up that ball and run with it. This is about being honest, with ourselves, with each other and with our bodies. *Because I blog with integrity, you will always know how I acquire a product I review. Being given a sample of a product is never an exchange for a good review. I will always be honest about the products I am testing both in how they work for me and how I received them. Nina Garcia, who is one of the judges on Project Runway and fashion editor at Marie Claire magazine just had a baby. She’s 45. Go team you. And once again, mazel tov to you all! Congratulations! That’s tremendously exciting news, and I love that you are using your life experience to fill a gap in the blogosphere. Congrats! Alex is going to be an awesome big brother. I am THRILLED for your whole family. And I so needed happy news like this today. Thanks for that, too! ugly! (I think finding summer fashions is easier than winter.) OH! Andrea: Would love to get together, I know we’ve been wanting to do so even before this news. Lets do it. I do know about that site, but it doesn’t seem to have been updated in years! A shame because the information is good. Stefania: I’ve definitely been warned that I will also have 2 glucose tests. I will be having some non-invasive risk tests but have also refused the amnio. Love your maternity wear ideas.. I also recently (and surprisingly!) had luck at Motherhood Maternity in their regular sizes! There was a huge sale at a physical store so I went in. They had a small rack of plus size but they all seemed too big and baggy (in the legs, for pants, not in the belly). The woman helping me told me to try an XL in regular sizes and it fit perfectly! I was shocked. Will write a post on more of this later, but there are many more choices than I thought. I used to work with you when I was managing editor of STEP and Dynamic Graphics magazines. I am so happy for you and your family! How exciting! I just had my first baby 2 weeks ago at age 36 and plus size, so I know what you’re dealing with. I started out with high blood pressure and hypothyroidism (just found pre-pregnancy), plus chronic asthma, and then of course was hit with gestational diabetes. The GD was silly, because my levels were never high; the doc even let me start taking it 3 times a week since it seemed so pointless. I just tried to eat as healthy as I could and avoid super high fat foods. Anyway, my point is that I felt terrific throughout my pregnancy—it was the doctors always throwing a wrench in my happy plans! They induced me a couple of weeks early and I delivered a healthy baby and have already lost 20 lbs. I found a nice pair of pants at JC Penney, and believe it or not, 2 of my prepregnancy Lane Bryant pants continued to fit all the way til the end, just had to pull them down a bit in front. I also enlisted my sister to add a maternity panel to 2 pairs of jeans. I got some nursing tops at the Gap, but they are so low cut, I have to wear something under them which defeats the purpose. I did get a few shirts at motherhood maternity as well, and found some good ones at Goodwill/Salvation Army. And I love my yoga pants! Marcy!!! How are you! From the looks of it, happy, healthy and a mom! Congrats to you! 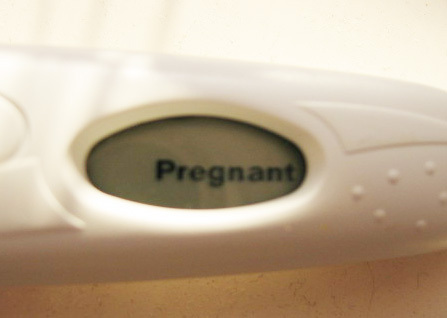 When I was pregnant with my first, I did the one GD test at the end of pregnancy, this time around, there will be 2. I guess thats a new thing? I will have one at my next appointment when I will be 15 weeks. I did not have it last time, but did have to go through the 3 hour test. I’m glad you felt good throughout your pregnancy despite what the doctors have told you.. thats really the best way to judge how you are doing in my book. I’ll have to try yoga. I’m going to start with swimming. I do hope you’ll keep in touch!